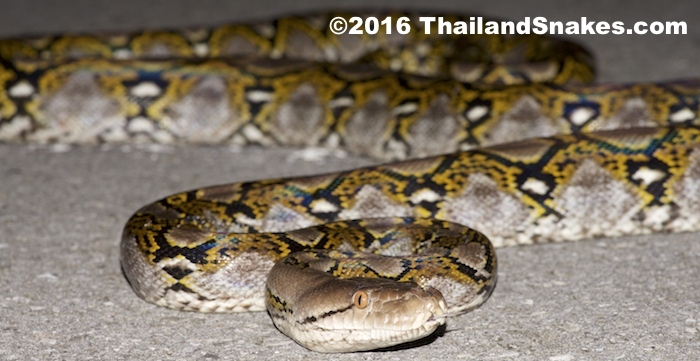 The Reticulated Python is found throughout Southeast Asia, and is very common here in Thailand. This snake reaches a maximum length of approximately 30 feet long (near 10 meters), and is one of few snakes which can be considered dangerous to human beings, sometimes preying on children or people sleeping. We’ve probably all seen photos of big Pythons cut open to reveal a human man inside. Not a comforting sight! 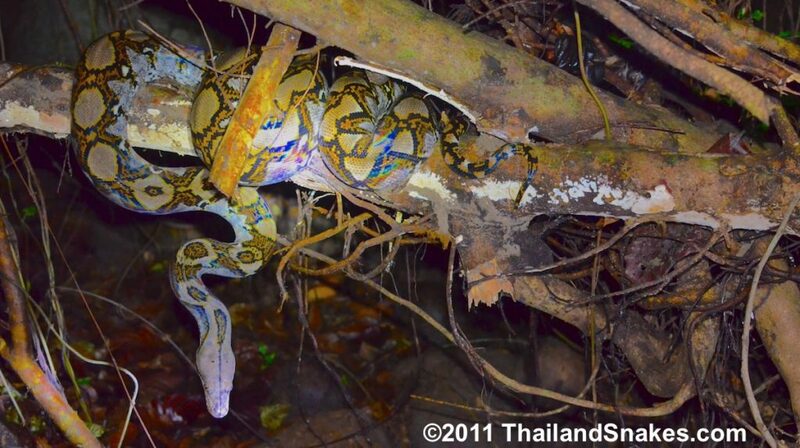 The biggest Python I’ve seen in Thailand was about 6 meters long. It had just eaten a goat, and was put on display in Krabi Town’s center. I couldn’t imagine seeing another bigger Python that was 10 feet bigger than that. There are specimens on record that reached 29.9 feet (9.1 meters). There is a constant stream of claims coming from all over Asia about the longest Python in the world. Why Is It So Difficult To Decide Who Found the Longest Snake? The problem, is in measurement. Some people who find a big python will get a string of people together holding it at waist high and say – ‘look how many people here holding this snake, it must be the biggest in the world!’ No measuring tape – just that. Come on, right? Others try to measure a live snake, and realize, it’s just impossible to stretch the snake out to its full length when alive – it refuses to relax enough to do so, and it is impossible to force the body to be straight due to the Python’s strong muscles. The only good length measurement of a large Python can be done when the snake is dead and totally relaxed. But, you must measure before the snake starts to stiffen up and become shorter. What About the Anaconda? Isn’t the Anaconda the Longest Snake on Earth? No. It’s a matter of semantics. The South American Anacondas can weigh more than Reticulated Pythons, but they do not reach greater lengths. The longest Anacondas, the Green Anaconda (Eunectes murinus) reach lengths of around feet (7 meters) and can weigh over 100 kg (source). Pythons never reach that weight in the wild, though in captivity just about anything can happen depending what the snake is being fed. What Is the Longest Python a King Cobra Could Eat? Pure speculation here, but I couldn’t resist. I think the largest Reticulated Python a huge 5+ meter King Cobra could or would eat would be around 3 meters. I think the pythons are too heavy and dense a meal for the kings to eat any snake bigger than that. A three meter python can weigh 20+ kilograms. 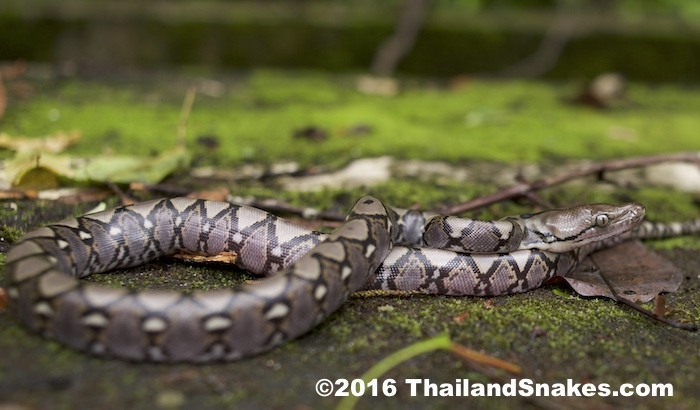 This extra weight would slow the King Cobra down in the wild considerably, and take weeks to digest, and probably the King would prefer a smaller snake, like one or two of the big rat snakes (P. carinata, or P. mucosa) instead. I’ve seen Kings eat 2 meter long Retics in captivity – it’s a good-sized meal for a big King.